Despite what some detractors may say, the speech delivered by President Obama at Georgetown University will reverberate across America and around the world. June 25th, 2013 will be remembered as the day America committed itself to act domestically and lead globally on climate change. It is not overstating the case to say the President’s speech signals an end to the debate on climate change and the beginning of a consorted effort to reign in greenhouse gas emissions. The President’s ambitious speech has far reaching implications that involve both mitigation and adaptation. “As a president, as a father and as an American, I’m here to say we need to act,” Obama said. Going forward, climate change impacts will be factored into every governmental decision including procurement, land and water management, infrastructure spending, and resource development. For a more detailed review of the plan, click here. For the full transcript of the President’s speech, click here. Republican resistance to the President’s initiatives are as dependable as a Swiss watch. Even before Obama unveiled his plan on Tuesday afternoon, Republicans in Congress were already on the attack. They declared the plan to be a job killer that would undermine the recovery. Republicans continue to flog the same ideas knowing that they will gain some traction with the American public. “It’s tantamount to kicking the ladder out from beneath the feet of many Americans struggling in today’s economy,” Senate Minority Leader Mitch McConnell, R-Ky., said on the floor of the Senate. In a more blatant effort to inflame the public, Don Stewart, a spokesman for Senate Minority Leader Mitch McConnell, R-Ky., said imposing carbon rules on power plants amounts to a national energy tax. The President responded to his critics preemptively when he remarked, “that’s what they said every time and every time, they’ve been wrong.” Obama stated that research, technology and innovation are American strengths that will help lead the world in the war on climate change. Republicans are almost unanimously impervious to reality. They refuse to comprehend that the planet is warming, they seem blind to melting arctic ice and devastating droughts. They will not even acknowledge that extreme weather already causes hundreds of billions of dollars worth of damage. Republicans deride the employment potential from the green economy. They ignore the current staggering cost of climate change including extreme weather, and they seem oblivious to the fact that the situation is destined to get far worse if we continue with business as usual. Most importantly, they refuse to appreciate that the devastating impacts of runaway climate change will dwarf any costs associated with transitioning to a greener economy and more sustainable employment. The longer we wait the more it will cost and the less likely we will be to stave off the worst impacts. In a comment that directly addressed Republican climate deniers, the President mockingly said “we do not have time for the meeting of the flat earth society.” He went on to say he has no patience for those who deny that humans are contributing to the warming of the planet. Support for the President’s national climate strategy is far from unanimous even among environmentalists. Those who want to see more from the President need to view his actions from a historical perspective. Obama’s national climate strategy is the most consorted effort to combat climate change in the history of the United States. Even in his first term Obama made more environmental progress than any President in American history, including great strides in renewable energy and fuel efficiency. Bill Snape of the Center for Biological Diversity is among those who were not satisfied with the President’s speech. He described it as too little, too late. “What he’s proposing isn’t big enough, doesn’t move fast enough, to match the terrifying magnitude of the climate crisis,” Snape said. While Snape may even be right, he is still wrong. He and others like him do not understand the politics at play nor do they countenance the limitations of the President’s executive powers. Further, the President has to protect the interests of his party ahead of the 2014 midterms. Dan Lashof of the Natural Resources Defence Council is among those who disagree with Snape. It is understandable that many people are frustrated that the President did not go further. In particular, his apparent support for domestic fossil fuels and fracking in particular was undeniably disappointing. However, those who wish the President would have done more need to understand that the President is not omnipotent, nor does he operate in a vacuum. He can expect legal challenges from interests in the old energy economy and by sidestepping Congress he can also expect that lawmakers will introduce legislation to stymie his national climate strategy. House Republicans have shown themselves to be especially tenacious in their opposition to the President and they will do everything in their power to undermine him and his plan. “This action – if followed by skillful and thorough execution of the plan – has the potential to fundamentally alter the course of our nation’s energy infrastructure development and help to promote a sustainable future. On the international front, this action will bolster U.S. credibility and moral authority in negotiations with other countries,” Gore said. While Gore conceded that more needs to be done, he also indicated that Obama can succeed if he uses the bully pulpit of the Presidency to good effect. Obama’s speech vindicates those who have supported the President and who held out hope that he would make a serious attempt to combat climate change. His detractors, particularly those who call themselves environmentalists, should be ashamed of their lack of support for these ambitious actions. Within the purview of his power, and the realities of the current political landscape, the President is moving boldly forward. 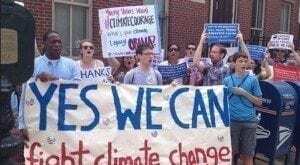 June 25, 2013 is an important day for us and for our planet and it will be remembered as the point in history when America enjoined the struggle against climate change and assumed a leadership role. Stay tuned for the companion piece to this article on the politics of fracking to be published in Global Warming is Real next Thursday. Words, words, words. Again kicking the can down the road. Saying that we are committed to action but deferring concrete definitive steps till next year fails grossly to reflect the serious situation that we are now in as a result of decades of inaction. While action is the only thing that really counts, those of us interested in change cannot afford to ignore the political realities that impede action. In a democracy words are often a necessary precursor to action. Given the intransigence of congress, Obama is using his executive authority to do what he can within the confines of his constitutional powers. Rather than rail against this President, I think our efforts are better spent marshaling public opinion so that we can achieve the critical mass that will augur real change.